Morocco is unique. A country characterised by its geographic diversity and cross-cultural influences. Morocco still epitomises an exotic old-world atmosphere lost to so many destinations. A place where vibrant souks overwhelm first-time visitors with their chaotic rhythm and the heady aromas of spices and local cuisine. At times with an overpowering intensity. Here is a collection of books about Morocco that will transport you to this enchanted land. Books that remind us that we can still invoke the sights and smells of a faraway place from the pages of a well-written book. Whether preparing for or considering a trip to Morocco, these books will help you gain a better understanding of Morocco’s rich history, culture, customs and geography. These books are the essential reading list beyond the guidebooks. From the dunes of the Sahara to the cosmopolitan cities of Casablanca and Tangier, there is something here to inspire you and give you a deeper understanding of this unique country. These are the best books about Morocco. Acclaimed American novelist Paul Bowles lived in Tangier for 52 years. He has a unique place in writing about Morocco, a country he was passionate about. A great introduction to Paul Bowles is the thrilling anthology of his collected travel writings and essays from 1950-1993, Travels. Spanning more than sixty years, Travels is a collection from Bowles’s early days in Paris to his time in Ceylon, Thailand, Kenya, and his life in Morocco. It contains two works on Tangier: Letter from Tangier and A View from Tangier, which reveal his love of the city. The acclaimed essays in Travel are insightful, exciting, and evocative. A stunning collection of rarely seen shorter works from one of the great American writers of the twentieth century. Set in Fez, Morocco, during the country’s 1954 nationalist uprising, The Spider’s House deals with the political upheaval against the French colonialists. This book explores the gap in understanding between cultures with the dilemma of an outsider in an alien society but the knowledge of a local. Showcasing Bowle’s exceptional narrative skill, this is possibly his most delightfully subtle novel. Lavishly descriptive of its setting and uncompromising in its characterisations. The Spider’s House is described as “dramatic, brutally honest, and shockingly relevant to today’s political situation in the Middle East and elsewhere”. This book details Suzanna Clarke’s experience of buying a dilapidated Moroccan riad in Fez with her husband in a mission to restore it to its former glory. A hilariously light-read. Clarke documents her love for the city of Fez, the community and the heart-warming relationships that she and her husband found while navigating the difficulties of renovating a ruined riad in the Fez Medina. “Trust us when we say it’s not as easy as the finished riad looks”. The Secret Son is about a poor boy, Youssef, raised by his mother in a one-room house in the slums of Casablanca. With big dreams of living another life in another the world, Youssef discovers his father-whom he’d been led to believe was dead, is not only alive but a very wealthy businessman. Seemingly eager to give his son a new start, Youssef leaves his mother behind to join the luxurious life of Casablanca’s elite. He revels in a life of luxury until a reversal of fortune sends him back to the streets. Trapped once again by his class and painfully aware of the limitations of his prospects, he becomes susceptible to the ideas of a fringe Islamic group. For the most accurate descriptions of Morocco, we look to Moroccan authors. In Laila Lalami’s debut novel, The Secret Son looks at the struggle for identity, the need for family and love, and the despair that grips ordinary lives in a world divided by class, politics, and religion. The great American novelist Edith Wharton gives us her colourful and textured travel memoir “In Morroco”. Wharton writes about her time in 1920 travelling through Morocco as the guest of Hubert Lyautey, French Governor General of the Protectorate. Wharton inspires the reader with a sense of wonder and curiosity that served as the impetus for her travels. Considered a travel writing classic, In Morocco is an extraordinary account of her journey to this exotic Northern African land during World War I. Written with the eye of a documentarian, Wharton explores the culture, history, and beauty of a Morocco in an intriguing combination of realism and romantic prose. Wharton weaves together anthropology with poetry as she writes about the interactions she has in Morocco and with Moroccan culture in all its splendour. “In Morocco” is an awe inspiring read full of wanderlust. Walter Harris first arrived in Morocco in 1887 as a correspondent for The Times of London. He died in Tangier in 1933 having lived through the tumultuous last years of Morocco’s ruling Sultans and the loss of the country’s independence. First published in 1921, Morocco That Was is a first-hand narrative of that pivotal turning point in Morocco’s history. Having a reputation for being capable of even befriending his kidnapper, Harris was a friend to at least three of the ruling Sultans. Legend has it, only three Christians had ever visited the walled city of Chefchaouen: one came for an hour disguised as a rabbi, one was poisoned, and the other was Harris. Morocco That Was is alternately sharp, melodramatic, and extremely funny. Harris’ writing puts unusual humanism and detail to the historical parade of conquests and political manoeuvring that defined Morocco during his years there. These are the vanished days of the unfettered Sultanate in all their dark, melodramatic splendour. A mix of elegance and poverty, culture and barbarism, refined cruelty with naive humour. A vivid and lively combination of the perceptive and reliable observer, and romantic eccentric, this book remains a travel classic for good reason. Like a good travel companion and friend, Harris takes the reader by the hand and shows us the Morocco he knew. A world, with all its failings, horror and splendour. In a similar vein to A House In Fez, English travel writer Tahir Shah shares an entertaining and amusing account of making an exotic dream come true. Equally hilarious and harrowing, this is the story of his family’s move from London to the city of Casablanca. Inspired by the Moroccan vacations of his childhood, Shah documents his family’s move to Casablanca to renovate a crumbling ruin of a mansion by the sea that once belonged to the city’s caliph or spiritual leader. After signing the contract, Tahir is amazed to learn the house is infested with jinns; invisible evil spirits said to occupy empty spaces. With the home empty for many years, the fervent belief in their presence hampers sleep and renovation plans. From exorcism rituals involving sacrificial goats to dealing with gangster neighbours, the Shahs must cope with a new culture and the remarkable, sometimes bizarre experiences they have in the process. Where Islamic tradition and African folklore converge–nothing is as easy as it seems. The Caliph’s House is a captivating story charting a year in the life of one family who takes a tremendous gamble allowing us to discover a world of deep contrasts any true adventurer would be thrilled to call home. Marrakech is the essence and lifeblood of Morocco’s ancient storytelling tradition. Storytellers have gathered in Jemaa el Fna square for nearly a thousand years to recount ancient folktales to rapt audiences. A unique chain of oral tradition previously passed seamlessly from generation to generation. A tradition teetering on the brink of extinction. After many years studying the storytelling tradition on Jemaa el-Fna and witnessing first hand the death throes of this vibrant and captivating tradition, Richard Hamilton recognised a need to preserve this dying art. Deep in the labyrinth of the Marrakech medina, Hamilton has tracked down the last few remaining storytellers and recorded the stories filled with moral reminders and the mysteries and beauty of the Maghreb. These are the ancient stories told in public in Jemaa el-Fna square, and in the home amongst family members. A must-read for anyone travelling from Marrakesh to the Sahara Desert, the book documents the extraordinary story of the rise and fall of the Glaoui brothers reign over the red city and the kasbahs to the south. Warlord brothers, Madani and T’hami, carved out a feudal fiefdom in southern Morocco and Marrakesh from the early 1900’s until 1956. Turncoats of the French colonial administration, they combined the aggression of gangland mobsters with the opulence of hereditary princes ruling with a mix of flamboyance and terror. In 1953, after returning from the coronation of Queen Elizabeth II, in a display of power, T’hami fiercely ordered the severed heads of his enemies to be mounted on his gates. Only three years later, when the French left Morocco in 1956, the Glaoua regime toppled like a pack of cards. “A classic story of history, intrigue, mystery, and action”. 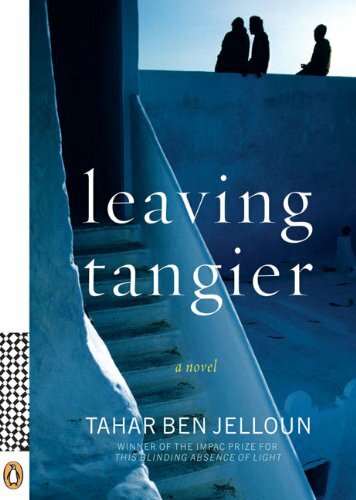 Award-winning, internationally bestselling author Tahar Ben Jelloun tells the story of a Moroccan brother and sister making new lives for themselves in Spain. Leaving Tangier chronicles the challenges of emigration and the hold Morocco has on its countrymen, who can never forget their roots. Young Moroccans regularly gather at Tangiers seafront cafe’s to gaze at the lights on the Spanish coast glimmering in the distance. Azel is a young man who dreams of crossing the Strait of Gibraltar and is intent upon leaving one way or another. At the brink of despair, Azel meets Miguel, a wealthy Spanish gallery-owner, who promises to take him to Barcelona if Azel will become his lover. He leaves behind his girlfriend, his mother and his sister, Kenza, and moves with him to Barcelona, where Kenza eventually joins them. What they find there forms the heart of this novel. A story of seduction and betrayal, deception and disillusionment. Azel and Kenza are reminded powerfully not only of where they’ve come from but also of who they really are. Also by Tahar Ben Jelloun the first Maghreb winner of the Prix Goncourt award, this 1985 novel is set in colonial Morocco. A story of Mohammed Ahmed, a girl, raised as a boy due to her Moroccan father’s effort to avoid Islam’s inheritance laws regarding female offspring. Already father to seven daughters, Hajji Ahmed is determined his eighth child will be a male. And so, the infant girl is named Mohammed and raised as a male along with all the privileges granted exclusively to men in traditional Arab-Islamic society. As Ahmed matures, her desire to have children marks the beginning of her sexual unfolding, and as a woman named Zahra, Ahmed begins to explore her true sexual identity. Tahar Ben Jelloun offers a creative and radical critique of contemporary Arab social customs and Islamic law, a poetic vision of power, colonialism, and gender in North Africa. The Sand Child is celebrated around the world as a courageous and significant work of international fiction. What better way to get inspired about Morocco and get a feel for the culture and its cuisine than with a great Moroccan cookbook. A Month in Marrakesh is the go-to cookbook for preparing the most common day to day dishes served in a Moroccan kitchen. Duo Andy Harris and David Loftus teamed up to present a cookbook that demystifies Moroccan cooking with recipes tailored to the home cook. Part cookbook and part travelogue, A Month in Marrakesh is an evocative account of the colourful and delicious flavours of Morocco. The book covers all aspects of Moroccan cuisine, from breakfasts and snacks to tagines, roasts, and desserts. It offers a deeper understanding of the local cuisine and its flavours. Great reading before visiting the Moroccan spice markets. It also describes how to prepare some of Morocco’s ingredients such as preserved lemons, harissa and hibiscus syrup. With stunning images by Photographer David Loftus, who has not only captured the food but also its role in daily life in Marrakech. A Month in Marrakesh showcases the food and culture of Morocco as you’ve never seen before. A lavish and intoxicating mix of ancient and modern. Loaded with useful hints, personal, handwritten vignettes and line drawings that give an intimate feel to Andy’s inspiring recipes.